Monkey Math School Sunshine is a fun learning app that helps teachings your child math and we have 3 copies to give away! ADD IT UP and TAKE IT AWAY: Use your addition and subtraction skills to solve math problems. Trusty animated crab assistants supply multiple-choice options. PATTERNS: Monkey has a problem: Objects keep popping out if his bucket, creating a pattern – but one piece is missing! Help the monkey by completing the pattern with the choices provided. SHAPES: Is it an octagon? Or maybe a hexagon? Count each side of these shapes to help Monkey figure it out. SEQUENCES: Monkey has a group of numbers in the right order, but some are missing. Help him complete the sequence with the correct numbers. 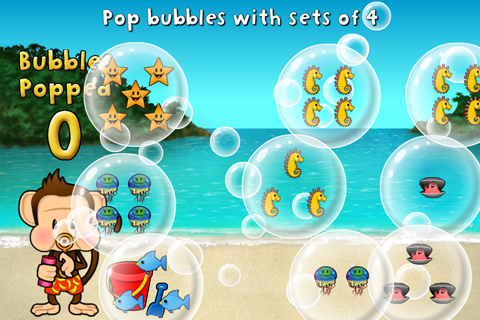 LESS/MORE: Monkey loves to blow bubbles, but when he does, groups of shells, fish or turtles are inside each bubble! Use your expertise to figure out which bubble has either the most or least objects inside. BIGGER/SMALLER: Which bubble has the bigger number? Which bubble has the smaller one? Help Monkey figure it out by popping the correct bubble. CONNECT THE DOTS: Baby Turtle is stuck on the beach and she needs your help to get to the sea! Connect the dots to show her which way to go. 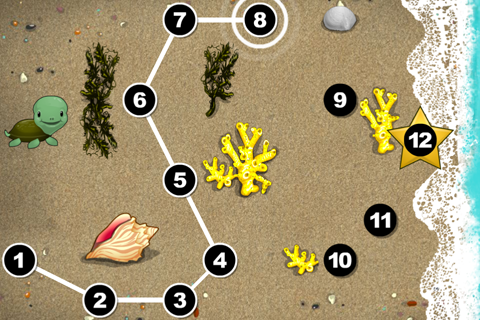 WRITE IT UP: Help Monkey identify numbers by tracing them in the sand. 9 interactive games that teach kids about sequencing, patterning, counting, adding and subtracting. With very little interface, your child presses one button to immediately launch into uninterrupted play. Uses Knack™ Technology to instinctively adjust the challenge levels to each individual player. Irresistibly cute monkey guides the child through game play with animated celebrations for correct answers and gentle redirection for incorrect ones. Kids collect rewards in their ANIMATED AQUARIUM. We’ve got 3 copies of Monkey Math School Sunshine to give away, and it’s super easy for you to enter to win one of them! There are several ways for you to enter to win and you can do as many of them as you’d like. The more ways you enter, the better chance you have of winning! The contest will run from today until September 1, 2012 at 12:01 am, EST. (In other words today through the end of the week) and winners will be announced on Saturday, September 1st! Just click on the Rafflecopter box (or linke) below to see all the ways you can enter to win a free copy of Monkey Preschool Lunchbox for iPhone / iPad. By the way, depending your internet connection it may take about a minute for the Rafflecopter box to display, so if you don’t see it, please be patient. If you don’t see how to enter after a few minutes, please leave a comment below letting me know, and I’ll try to help you.